Fans of the French team celebrated a goal at LabCentral in Cambridge on Friday. Cambridge Consultants does not run an office pool for March Madness basketball, and you are not likely to find its 35 Boston employees bantering about the latest Red Sox game at the company’s new office in the Leather District. Yet these workers, who specialize in developing medical devices, are being swept up by the World Cup soccer tournament in Brazil. As part of a company sweepstakes, each employee picked a country to cheer for, and lunchroom conversations revolve around standout performances on the pitch. Boston’s high-tech workers typically are not known as big sports fans, but the World Cup is bringing out untapped athletic enthusiasm in people who are usually more comfortable talking about actual chemistry than team chemistry. One explanation is the high number of foreign-born workers in high-tech industries. About three quarters of visas issued each year to skilled temporary workers go to computer systems analysts, software developers, and similar professionals, according to the US Labor Department. In many other countries, soccer is the top sport. Also, many young tech workers grew up during a period when soccer took over youth sports in the United States. Youth league participation has more than tripled since 1980, according to the US Soccer Federation, and a survey this year by the Sports and Fitness Industry Association showed that soccer is the second-most-played sport by kids, behind only basketball, with 6.6 million players. Some 26 million viewers in the US watched the national team’s tense draw with Portugal Sunday evening, either on TV or on streaming video from ESPN and Univision, according to ESPN and Neilsen. That is the largest viewing audience ever for a soccer game in the United States. Another important attraction of the World Cup is the ability of sports neophytes to join in the World Cup frenzy without feeling out of place or being judged for their lack of soccer expertise. Passionate followers of the big American sports, such as football and baseball, often complain about fair-weather fans who only take an interest when the local team is winning. Hard-core Red Sox fans have even coined a special term for these dilettantes: “pink hats,” after the trendy pastel-colored Bosox ballcaps. Among World Cup aficionados, there is no such disparagement, said David Bradshow, who directs the Boston office of UK-based Cambridge Consultants. A sports-averse engineer who might be unlikely to join a hockey conversation for fear of seeming clueless need not be intimidated by talking about the World Cup because the game’s finer points are secondary, he said. In the lobby of LabCentral, a shared laboratory facility for life-sciences startups in Kendall Square, a 168-inch video board made of nine TV screens has been commandeered to televise soccer matches in place of the usual reel of scientific diagrams. 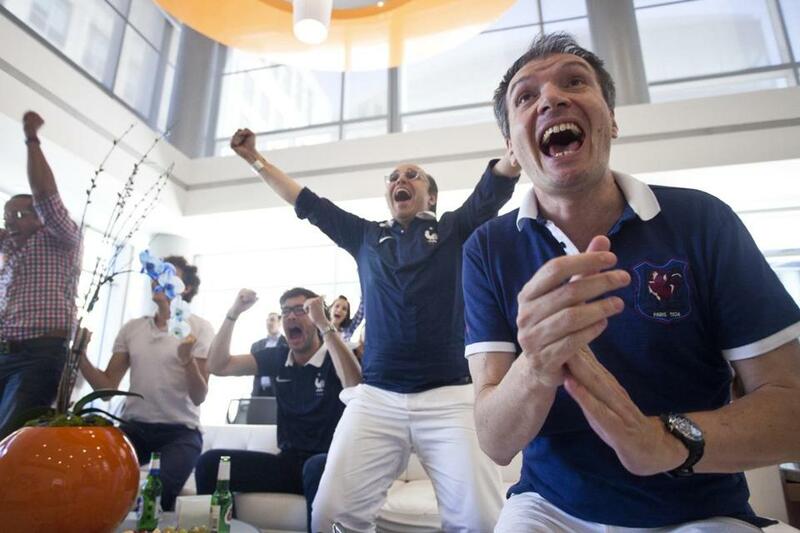 LabCentral is now a destination for big-screen viewing parties: Staff from Boston’s French and Swiss consulates, for example, visited on Friday afternoon to watch their countries face off, a match in which France torched its European neighbor, 5-2. At IdeaPaint in Boston, which makes a whiteboard paint that is popular among tech companies, employees are showing up for work in Messi and Ronaldo jerseys, and executives have consented to showing games on a wall-mounted flat screen so workers can follow the teams in their office pool. “It’s the only way to keep our team in the office,” said vice president Jeff Chaitman. Different rooting interests have even interrupted the work flow at the Framingham-based software testing firm Applause. Spokesman Nick Lorenzen, who is of Portuguese descent, admitted to avoiding contact with the company’s Berlin office last week because he could not bear to hear his colleagues’ gloating after Germany shut out Portugal, 4-0. What is notable about World Cup fever striking high-tech companies is that even nerdy types who are immune to the excitement of a big Patriots game or a Bruins postseason run have been infected. “There are definitely people interested in the World Cup who did not bat an eye when the Bruins lost to Montreal” in the Stanley Cup playoffs, Lorenzen said. The latest hire at Cambridge Consultants is a prime example. At best a casual sports fan, Brian Mullen said he feels a magnetic pull from the World Cup because it offers great theater that even non-experts can appreciate, he said. “I’m pulling for the US, of course, but also for Brazil because they’re the home team,” Mullen said.